This afternoon Vince and I made the trek to the agricultural center at Alabama A&M to launch a few rockets for the kids at the 4H Urban Farm Day. 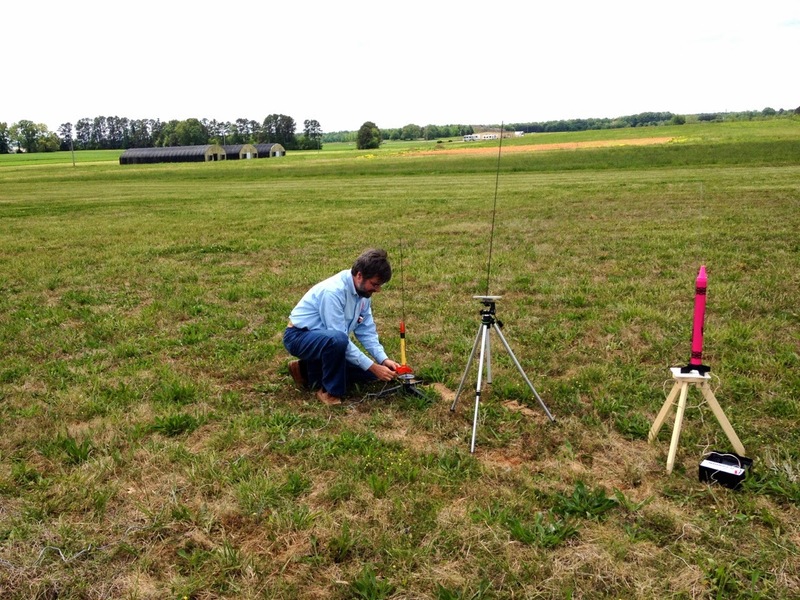 The weather was nice and sunny, which meant that we would actually be able to launch a few rockets today; the first time we were asked to participate in this event was during the great tornado outbreak in late April of 2011 (which cancelled the event, obviously), and it has seen rain every year since. In 2012 and 2013, we were forced to do indoor dog-and-pony shows, which were less inspiring and interesting to the kiddos. Today rockets would fly, much to the delight of the couple hundred school children watching. 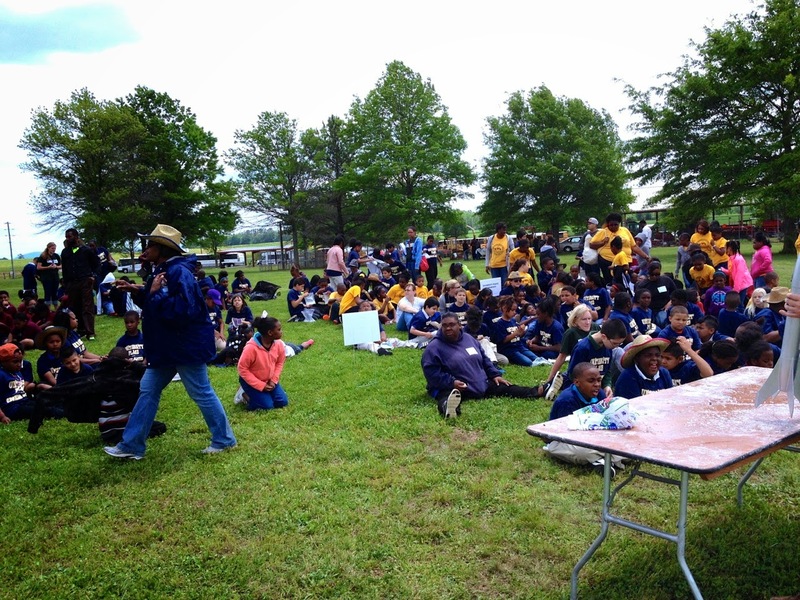 Some of the kids anxiously awaiting the launch of the first rocket. 8 is becoming the number for these demos, as Vince and I each prepped 4 birds for flight. Vince had an adopted tube fin rocket, an small Estes rocket from the 1990's (seen in the pic below), some other rocket which I do not remember, and an Estes Silver Comet, which flew on a D motor. It's terrible getting old - I have enough trouble keeping track of the rockets I fly, much less those of others. My apologies to Vince; I should have taken notes on my phone. I brought an Estes Snitch saucer (C6-3 motor), an Estes Pulsar Pink Crayon rocket (C6-3 motor), an old Estes Der Red Max (B6-4 motor), and my Deuce's Wild, which flew on two B6-4's. Following the pattern established a couple of weeks ago at Horizon Elementary, we alternated flights. My crayon was first, and despite the breeze, it landed relatively close to the pad. Vince followed with the small Estes rocket in the above picture; it too did not drift as far as I had originally reckoned. One of the adults and a couple of young ladies had no trouble retrieving any of the rockets we launched this day, and I am very grateful to them for enabling us to focus on putting the rockets in the air. The only "interesting" flights today belonged to Vince - the hand-me-down tube fin rocket went unstable on the C motor, lawn darting into the soft ground, and his Silver Comet had the nose cone separate. Fortunately, both pieces were recovered, so no issue as far as returning it to flight (parts for the Silver Comet are hard to find, especially the custom plastic nose). I ended the launch with my Deuce's Wild on 2 B motors. I had taped one of the keychain cameras to the rocket's body, capturing the video below. It is pretty normal, except that if you look closely, you can see the parachute wadding (flameproof toilet paper used to protect the parachute from the hot ejection charge particles) whiz by and fall toward the ground below. You can also faintly hear the kids cheering throughout the flight - again, got to love that enthusiasm! The animated gif below shows the sequence with the chute wadding slowed down to 3 frames per second - it's quite neat, actually. 8 launches, no rockets lost, and a free BBQ sandwich for lunch… A pretty decent couple of hours!